We 'borrowed' these photo's from the Oxford Biochar Research team. I'm sure they won't mind ........... will they ? No real reason for the photo, just I was getting really wordy. And it's nice to remember what it's all about ! CO2 have you heard of it ? Well that's a silly question, everybody has heard of it now - at last ! 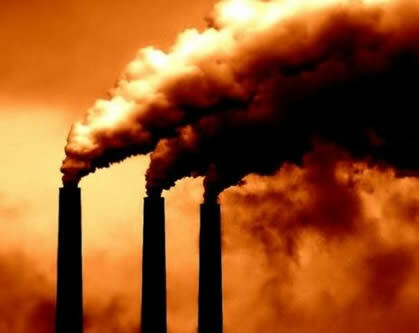 More and more carbon going up in the air, turning the Earth into a great big glass house. 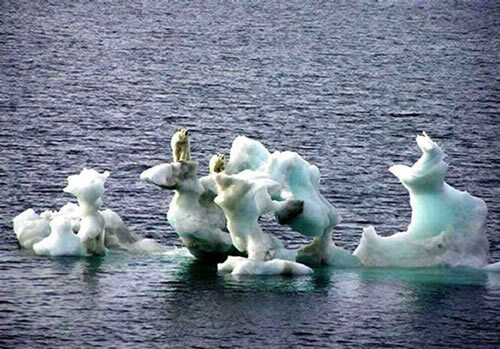 We're drowning islands, yet causing drought; shifting warm water currents, bringing colder temperatures; sunbathing in March, floods in July. Can we stop it ? Well......yes ! (No, I'm not going to bang on about not wasting things, sustainability again and again. Mainly we can reduce our emissions by just doing a little less of what we have been doing so much more of ! We all know what we should be doing, use less fuel, insulate more, do you really need something new, something unsustainable ... we all could go on and on. What a wonderful new idea, you take all this waste stuff you see, slowly combust it with little or no oxygen and out comes this wonderful ground enhancer that's called 'Biochar'. Wonderful this modern technology - except it isn't - MODERN that is. Mycorrhiza has been around for as long as the soil itself has, and we have been using slow burning techniques ( it's called 'pyrolysis') ever since we discovered charcoal. ( Earlier even, though they didn't know it. Ancient Amazonian tribes used to mix biochar in their soil. This came from their 'slash and burn' technique of clearing the forests. Now, thousands of years later, the soil they left behind - theTerra Preta - is still amazingly fertile. Areas of fertility in the really pretty fragile, thin fertility of the rain forest soil. Well the technique may not be new, but the huge problem it will help to solve certainly is ! 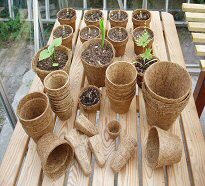 It's 'carbon capture technology' in your garden. Every 5 Kilograms of Biochar that you use will not only really, really increase the fertility your soil, but will capture 4 Kilograms of Carbon for probably thousands of years. Just think what would happen if we could get them to use Biochar instead ! 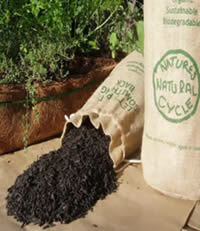 We totally believe in Biochar, and now I mix it with all my compost, about 10% does it. 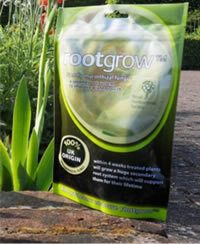 Then when I plant out I always add a dash of Mycorrhizal Fungi too, just enough to cover the spread of the roots. Seaweed granules are a wonderful addition to your growing media generally, but adding it to your compost for tomatoes and soft fruits will really make your plants happy – and fruitful ! 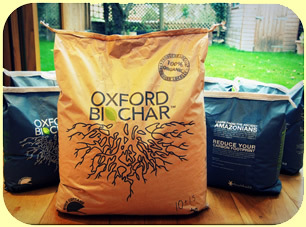 As you can guess we are very proud of our Biochar. The process used makes Biochar through a non-combusting thermal destructive distillation in an oxygen free environment. This makes for a Biochar with exceptional internal surface area, much more active than charcoal made by smouldering combustion. We also use the volatile off gasses produced by pyrolysis as fuel for the process, these environmentally damaging gasses are combusted in the furnace at about 1200 degrees to avoid the traditional practice of venting them straight to the atmosphere. All the Biochar produced is made from wood harvested from sustainably managed forests, and have a “Grown in Britain” licence which involves a full annual audit of the ‘chain of custody’ from the forest to your bag of Biochar. In fact, we could trace your Biochar back to the exact to the exact point in a forest that the bag you bought was harvested from ! 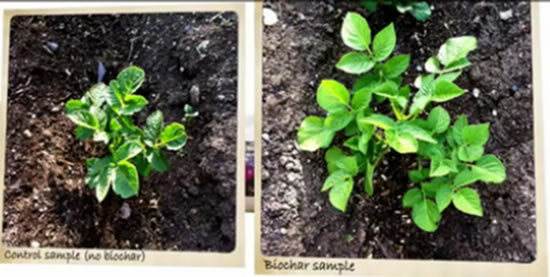 Biochar comes in two sizes. But how about a 'Special' Offer ? We do ask for a £6.95 contribution towards the cost of sending your Biochar, or your ‘Special Offers’, to you though, sorry ! 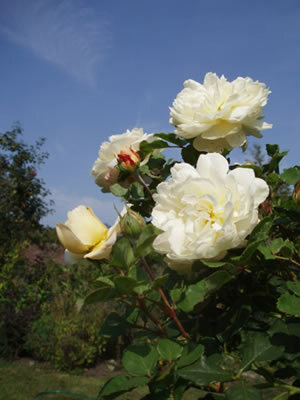 Remember this is pure Biochar, not mixed or diluted with any other compost - honest !